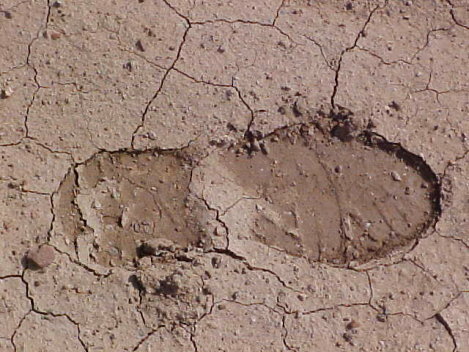 A RARE FIND -- Although nearly all SSAR team members are certified "man trackers," it is very rare that they find a full, detailed foot print such as this one. They usually have to track individuals on hard pack and rock. Man-tracking is a vital "tool" that has saved many lives. The weather now is awesome for rescue work. Not in the way you may think though. 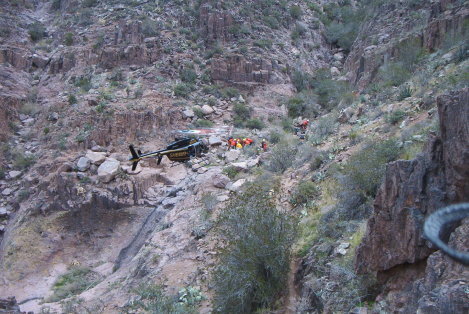 Superstition Search and Rescue has had another very busy year so far. We averaged 1.5 rescues a week for the first four months of 2008. In May, we saw a decrease of numbers down to one rescue a week. In June, when the temperatures reached the hundreds, fortunately, the number of people needing assistance drop to nearly zero. So, you see it is awesome weather for rescue work. As much as we love what we do, ultimately no rescue is a better option for either the rescuer or for those in need of rescue. In this heat, most people avoid the outdoors, and the few who do venture out, usually are the more experienced and are prepared. Even if prepared, there are risks. In this heat, the body can lose up to one liter of water an hour due to perspiration, evaporation, and urination. The average person can only absorb 24 ounces of water an hour. So, even if a person is hydrating, there is a potential of an approximate 10-ounce loss of water an hour. Dehydration affects body-core temperature, endurance, and most important — your ability to think. A mere 1 percent loss of normal body fluids starts affecting rational thinking. These consequences of water loss do not only happen to those who become lost or are the victims of injury. The dangers of dehydration are just as risky for the search team members. So when I say it is good weather for search and rescue, I mean it. It’s great because it keeps most of the unlucky, the lost, and the crazies where they should be — chillin’ in the indoors, pounding a large glass of ice water. TIGHT SPOT -- Rescuer Candace Hesson and "edge man" Mike Wallace perform a confined-space rescue. The shaft was 100 feet horizontal and 40 feet vertical. This was the second person in one month that the SSAR team had to pull out of this shaft. Both survived. TECH TRAINING -- Walt Berrant and Mike Mello are shown during a technical training last year. SSAR uses a team-based system for rescues. DPS HELO CERT -- Every three months, four SSAR team members have to re-certify with DPS to be qualified to perform long-line rescues (also called "short hauls") and to repel from the DPS helicopter. The long line is usually a 100-foot line attached under the helo, and the rescuer(s) is attached to a "rescue ball." Not many people are allowed to perform this in our state, and it is an honor that DPS has given SSAR four spots. Out of 15 counties in Arizona, 40 rescuers have a DPS certification, and eight members of SSAR hold that cert. ANOTHER SSAR SUCCESS -- When SSAR team member Robert Cooper took this photo, the rescue team had just spent 18 hours lowering an injured man down to this site for rescue. It took eight separate tech systems to get him here so he could be loaded into the hovering helocopter. LUCKY MAN -- This base jumper survived a partial opening. SSAR team members prepare him for transport.